1:Adjustable rope bracelet,its minimum size is 6.5inch, the maximum size is 9.4inch. 2:Elastic cord bracelet,inner length is 6.7 inches and it is elastic.Fits Most of the Size. 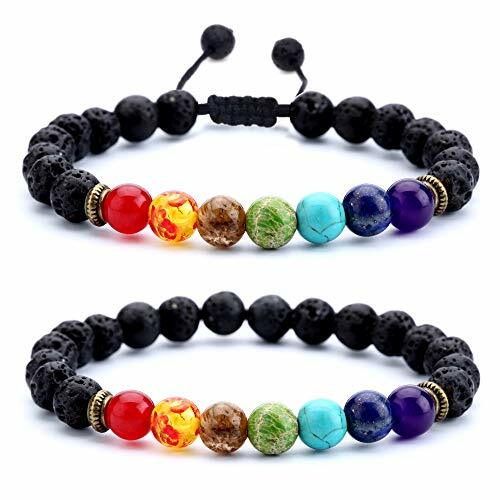 Yoga Bracelet:you can get the energy, and when you do yoga or meditation, you have better results. Promise 90-day Products Guarantee.Common features of natural stones:low density, light weight, and a cool feeling in the hands.Our volcanic stones put into water will not change the PH of water while fake stones will increase the PH to 8.4.